3 Bedroom Detached House For Sale in Evesham for Offers Over £260,000. A double fronted detached house with walled garden enjoying a southerly aspect. This contemporary detached home comprises; reception hallway with stairs rising to the first floor landing, with access into the W.C, lounge & kitchen/diner. The lounge has double doors into the rear garden. The W.C has a toilet & wash hand basin. The kitchen diner enjoys a dual aspect outlook, a range of base & wall units with integrated appliances, oven, hob & extractor. To the first floor, the landing leads on to all three good sized bedrooms, house bathroom & attic hatch. The master bedroom has an en-suite with a shower cubicle, W.C & pedestal wash hand basin. The house bathroom has a bath with shower over & shower screen, tiling to the wall, W.C & wash hand basin. Externally there is a driveway for two cars & a walled rear garden with a southerly aspect & mainly laid to lawn. The village of Badsey lies two miles east of Evesham. It has two parks, a first school, a local shop & two pubs. The home is walking distance of these amenities & is situated in a cul de sac. Evesham is under 20 miles from historic Worcester City, Shakespeare's Stratford upon Avon & the cultural & commercial centres of Cheltenham. 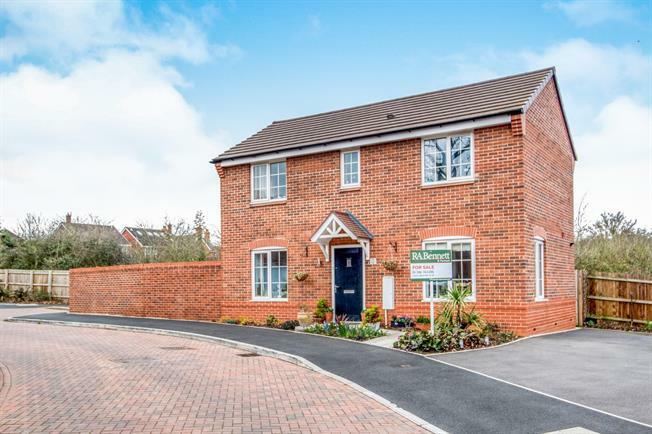 Evesham & Honeybourne also have a train station with direct links to London Paddington & Evesham has a wide range of amenities to include, restaurants, supermarkets, doctors & dentists, leisure centre, schooling, hairdressers & beauticians.